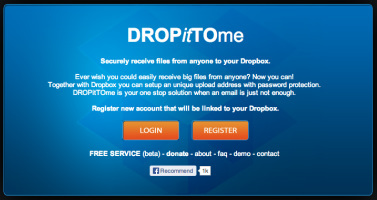 DROPitTOme - is a digital 'Hand In' folder that works through your Dropbox account. DROPitTOme allows you to set up a unique upload address and password so that anyone can send you files to a secure DROPitTOme folder within your Dropbox. It's a great way for students to hand in work - from school or from home, and from any device! To begin, go to DROPitTOme and follow the instructions to register for your account. You will need to log in to your Dropbox account as part of this process. You will also need to choose a username and password for DROPitTOme. The username will become part of the URL that your students will use. The image left is an example; my username is <watts> and you can see that my URL becomes <DROPitTOwatts>. The password you choose is the one that you will provide to your students, or others, in order for them to access the DROPitTOme service. It is recommended that it be unique from your Dropbox password. Because you will be providing both the URL (which includes your username) and the password to students, it is important that you are thoughtful about these choices. Once you are registered, a DROPitTOme folder will appear within your Dropbox. You will be given a unique URL which you will provide to your students, along with the password you chose. When students access this URL, with the password, they will be able to upload files, images or videos to your DROPitTOme folder within your Dropbox. This is a secure folder. Students or other users do not have access to the files in the folder; only you have access. DROPitTOme is a great way for students to share digital content with you. Try it - I think you and your students will appreciate how easy and functional it is!